Splitsville Anaheim - The Luxury Lane and Dining Experience! Disclosure: My visit to Splitsville Anaheim was hosted, but all thoughts and opinions are my own. Splitsville Anaheim – The Luxury Lane Experience! When you enter, there’s two lines, one for if you’re dining + bowling, and one if you’re just dining. I was thrilled to see you can go to Splitsville even if you just want to have a table service meal and grab a drink, especially with the upcoming busy summer months it will be nice to have more eating options at Disneyland Resort (especially for us vegetarians, but more on that later…). We got set up with bowling shoes, and in our lane! What I loved about how the lanes were set up were that there were only a couple lanes and tables side-by-side, so that you felt like you were having a private bowling experience with your party. Plus, all the lanes had a fun retro California theme. 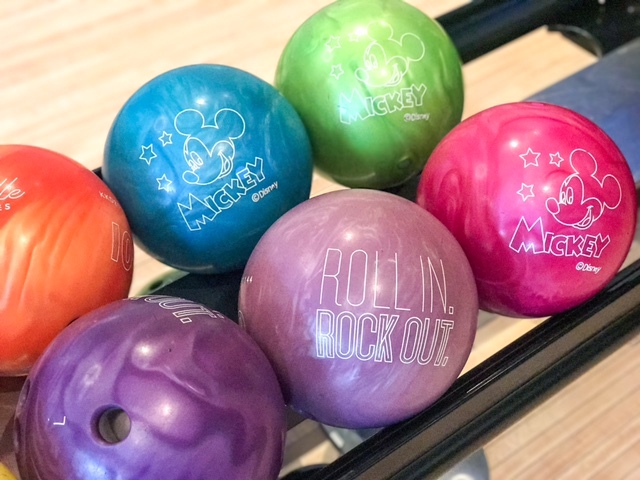 Many of the bowling balls had Mickey and Minnie Mouse on them – talk about a Disney geek’s bowling dream! It was my daughter’s first time bowling, and she was beyond excited to get to bowl with a Mickey Mouse ball. Splitsville Luxury Lanes were even kind enough to give us a bowling ramp for my 3-year-old to easily bowl. You just place the ramp on the lane, and they push their ball down! You can even request that they program the gutter bumpers to go up only when it’s specific players’ turns. Also to top off your dining experience, you can order a select drinks in a souvenir Splitsville cup! It was certainly an afternoon to remember, and I can’t recommend Splitsville Anaheim enough, whether you’re a tourist or a local it’s the perfect way to add more magic to your trip to Disneyland Resort.